Football - Brighouse Old Boys v Halifax Irish. Ian Brock for Old Boys and Anthony Brown for Irish. Halifax Irish Club have earned a home Halifax FA Cup semi-final date with sole Halifax AFL survivors Ryburn United. The West Riding County Amateur League side were 5-3 winners away to Brighouse Old Boys on Saturday. Goals from Tom Wright. Richard Heins and Matthew Richardson gave West Yorkshire League side Old Boys a 3-2 interval lead at Lightcliffe Academy but Irish came through strongly to take the spoils with two goals each from Eli Hey and Antony Brown and one from Ben Hiley. Ryburn had beaten Midgley United 3-2 in December. The other last-four contest will be between Elland pair and former Yorkshire Amateur League rivals Huddersfield Amateurs and Ealandians. Amateurs beat competition favourites Brighouse Town 4-1 at Old Earth on Saturday but there was controversy at 1-1 when the hosts were awarded a second goal to Matty Parker with Brighouse claiming the ball had not crossed the line. Jonny Crowther scored with a fine header and Parker’s 30th goal of the season with a crisp half volley, both after fine work down the right from Sam Halstead, wrapped up Amateurs’ win. Earlier, the Hove Edge club’s development side had been quick out of the blocks and taken the lead after 10 minutes. Lee Thrush equalised for the West Yorkshire League Division two side just two minutes into the second half. Ealandians booked their semi-final place with a 3-2 win over Illingworth St Mary’s two months ago. The semi-finals are on Saturday, March 19 (1.45). 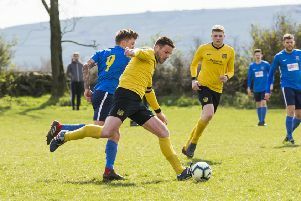 Ovenden West Riding went top of the West Riding County Amateur League - for the time being at least - with an 8-2 win away to the Premier Division’s bottom side Hunsworth on Saturday. The only disappointing aspect for the visitors was that they squandered chance after chance on a pitch that was waterlogged for most of the 90 minutes. They took a 15th minute lead through a Martin Woodhouse angled strike that beat the despairing dive of ‘keeper Brad Harrison from 15 yards. Five minutes later Hayden Kerris added number two direct from a corner. George Bamford, Steve Fullard, Scott Eastwood and John Booth all missed opportunities before Booth added the third with an excellent header from a Woodhouse cross. Bamford finished off a Booth cross, Eastwood coolly slotted home and Fullard atoned for his earlier misses with number six. Charlie Taylor pulled one back from a rare Hunsworth attack. The pitch was like a quagmire in the second half and West Riding only added two more through Woodhouse and Bamford before Taylor scored Hunsworth’s second. Ovenden have a point more than Huddersfield YMCA, who have played five games fewer.